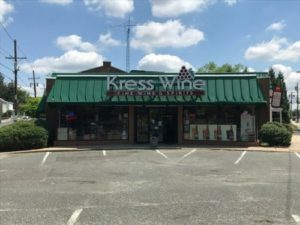 Wolf Commercial Real Estate, a leading Cherry Hill commercial real estate brokerage firm with expertise in Cherry Hill commercial real estate listings and services, now has available highly visible Cherry Hill retail space for sale at 2 Kresson Road and 21 Kresson Road Cherry Hill NJ. This well-located retail space in Cherry Hill NJ features a +/- 5,200-square-foot liquor store on a +/- .39-acre lot. There also is a +/- .46-acre parking lot across the street from this retail space for sale in Cherry Hill NJ that is included in the transaction. The asking sale price for this retail space in Cherry Hill NJ at 2 Kresson Road and 21 Kresson Road Cherry Hill NJ is $795,000. For more information about this retail space in Cherry Hill NJ, please contact Wolf Commercial Real Estate, a Cherry Hill commercial real estate broker that specializes in Cherry Hill commercial real estate listings and services. This Cherry Hill retail space for sale offers storefront façade signage and this retail space for sale in Cherry Hill NJ sits on a well-maintained property. An average of more than 23,000 vehicles per day pass by this Cherry Hill retail space for sale at the intersection of Potter Street and Kresson Road. There is abundant parking at this Cherry Hill retail space for sale on both segments of the property. This Cherry Hill retail space for sale at 2 Kresson Road and 21 Kresson Road Cherry Hill NJ is in a high demographic area of Cherry Hill Township. This retail space for sale in Cherry Hill NJ is near several high-traffic retailers and, in addition, this retail space in Cherry Hill NJ offers convenient access to I-295 and Route 70. More than 303,000 potential customers live within a five-mile radius of this retail space for sale in Cherry Hill NJ through Wolf Commercial Real Estate, a Cherry Hill commercial real estate broker that specializes in Cherry Hill commercial real estate listings and services. The average household income in the same five-mile radius of this Cherry Hill retail space for sale is $86,350. This Cherry Hill retail space for sale is available for immediate occupancy through Wolf Commercial Real Estate, a Cherry Hill commercial real estate brokerage firm that specializes in Cherry Hill commercial real estate listings and services. For more information about this Cherry Hill retail space for sale at 2 Kresson Road and 21 Kresson Road Cherry Hill NJ about any other Cherry Hill commercial properties for sale, please contact Jason Wolf (856-857-6301; jason.wolf@wolfcre.com) or Christopher Henderson (856-857-6337; chris.henderson@wolfcre.com) at Wolf Commercial Real Estate, a Cherry Hill commercial real estate brokerage firm. Wolf Commercial Real Estate is a leading Cherry Hill commercial real estate broker that provides a full range of Cherry Hill commercial real estate listings and services, marketing commercial offices, medical properties, industrial properties, land properties, retail buildings, and other Cherry Hill commercial properties for buyers, tenants, investors, and sellers. Please visit our websites for a full listing of Cherry Hill commercial properties for sale through our Cherry Hill commercial real estate brokerage firm.